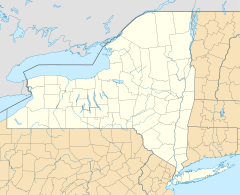 Mine Kill State Park is a 500-acre (2.0 km2) state park located in Schoharie County, New York, United States. The park is in the southeast part of the Town of Blenheim. Mine Kill State Park opened in 1973. It is named for Mine Kill Creek, which runs through a narrow gorge in the park and features the 80-foot (24 m) Mine Kill Falls. The park is located adjacent to the Blenheim-Gilboa Reservoir and its inflow, Schoharie Creek. Mine Kill offers year-round recreation, including snowmobiling, cross-country skiing, snowshoeing, fishing (trout and walleye), boating, hiking, mountain-biking, and swimming. The park features an Olympic-sized swimming pool, a diving pool, a wading pool, and a bath house. Located at the park is a pavilion which may be rented for private parties. There is a playground, numerous picnic tables, and charcoal grills on site. Among the park's 6.5 miles (10.5 km) of trails is a 3.5-mile (5.6 km) section of the Long Path. Starting in 2015, fees for parking and swimming at the park were waived for all visitors. The elimination of the fees was accomplished through an agreement with the New York Power Authority, who will compensate the New York State Office of Parks, Recreation and Historic Preservation $20,000 annually to offset lost revenue. Fees will continue to be charged for camping and picnic shelter reservations. ^ a b c "Mine Kill State Park". NYS Office of Parks, Recreation & Historic Preservation. Retrieved October 21, 2016. ^ a b "Section O: Environmental Conservation and Recreation, Table O-9". 2014 New York State Statistical Yearbook (PDF). The Nelson A. Rockefeller Institute of Government. 2014. p. 673. Retrieved March 6, 2016. ^ a b Natural Heritage Trust; New York State Office of Parks and Recreation; New York State Council of Parks & Recreation (1975). Fifty Years: New York State Parks, 1924-1974. Natural Heritage Trust. p. 43. ^ "State Park Annual Attendance Figures by Facility: Beginning 2003". Data.ny.gov. Retrieved August 14, 2015. ^ "Mine Kill and Max V. Shaul State Parks". NYS Department of Environmental Conservation. Retrieved August 14, 2015. ^ a b "NYPA, Parks Office Eliminate Parking, Swimming Fees at Mine Kill State Park". NYPA.gov. New York Power Authority. August 20, 2015. Retrieved November 27, 2015. This article about a location in Schoharie County, New York is a stub. You can help Wikipedia by expanding it.